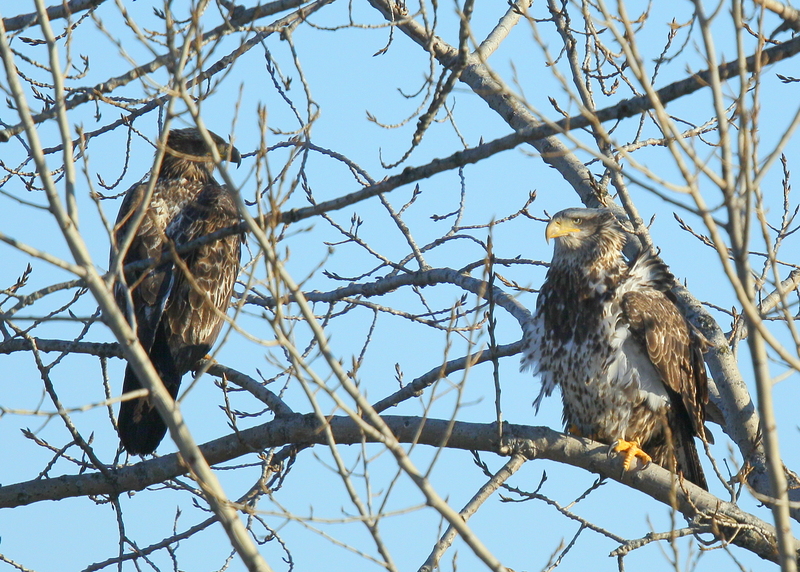 During an unscheduled afternoon run out for a local errand, had a nice chance to observe a pair of Bald Eagles perched in a tree overlooking the Merrimack River in Lawrence just behind the ballfields located on Incinerator Rd. in Lawrence! After the Red-tailed Hawk disrupted the Eagles from their perch, they continued to loop around in flight as though still a bit unsettled. It was one of those moments that you can only hope for with camera in hand. These slow proximate flight loops in bright sunlight can offer terrific moments for action/flight images. Such was this morning!! 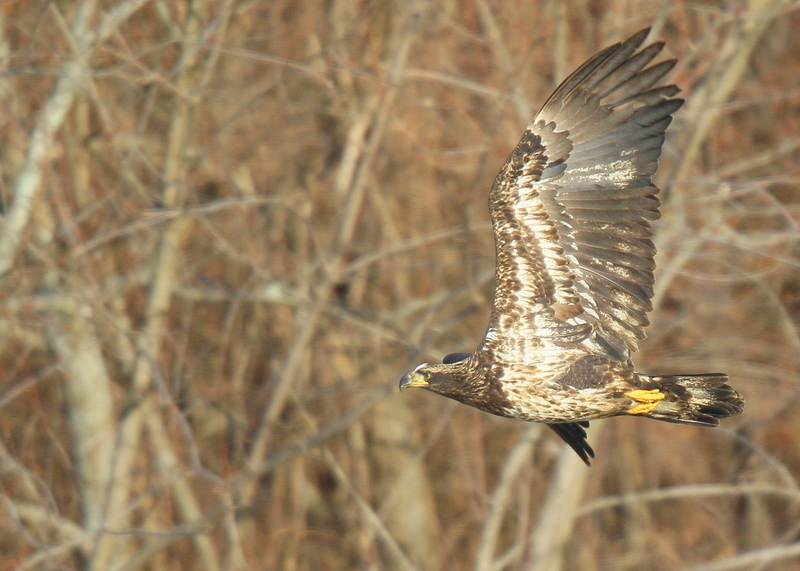 Another beautiful sunny morning looking for Eagles along the Merrimack River in Lawrence. What a treat to observe, a juvenile, a subadult, and an adult all from location on west side of NXStage Medical building on Merrimack St. Total of three perched in trees and then a Red-tailed Hawk caused commotion sending eagles into flight to ward off the uninvited intruder. Eagle and hawk in last photo. 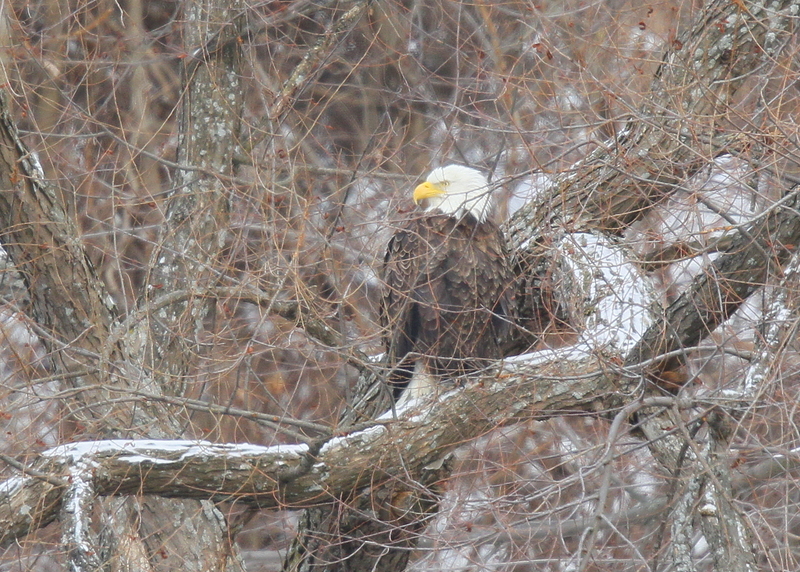 A single adult Bald Eagle in perch overlooking the Merrimack River in Lawrence! Another morning visit to Merrimack River behind 350 Merrimack St. in Lawrence. Overcast skies and a single subadult quietly perched in one of the normal locations! Likely a third year bird based on plumage and emerging white on the head. Peregrine Falcon pair; back on territory! 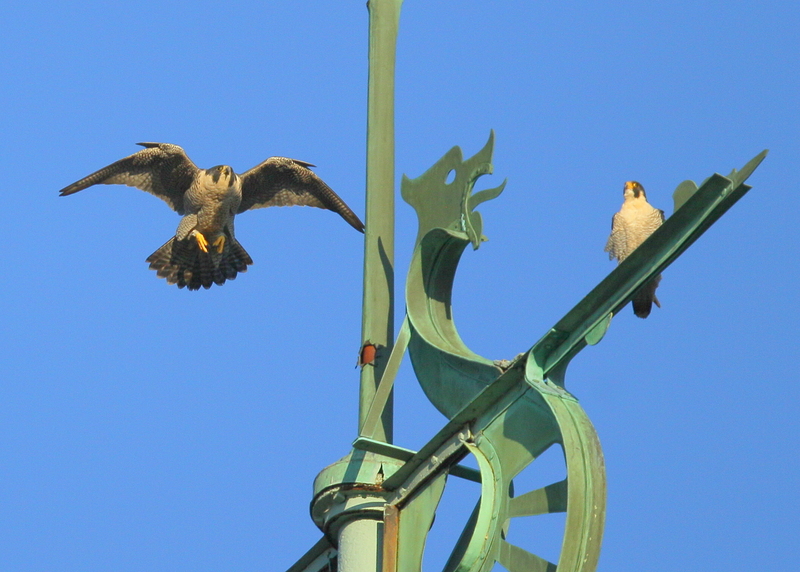 What a joy, not only make a number of peregrine sightings on Friday afternoon, but then to finally see both peregrines together atop the clock tower…..first time in 2 months seeing them together! Hooray! They both took turns in some playful flight around the clock tower in wonderful late day sunlight. Then, so nice to watch the grace of a landing atop the ball that crowns the weathervane! 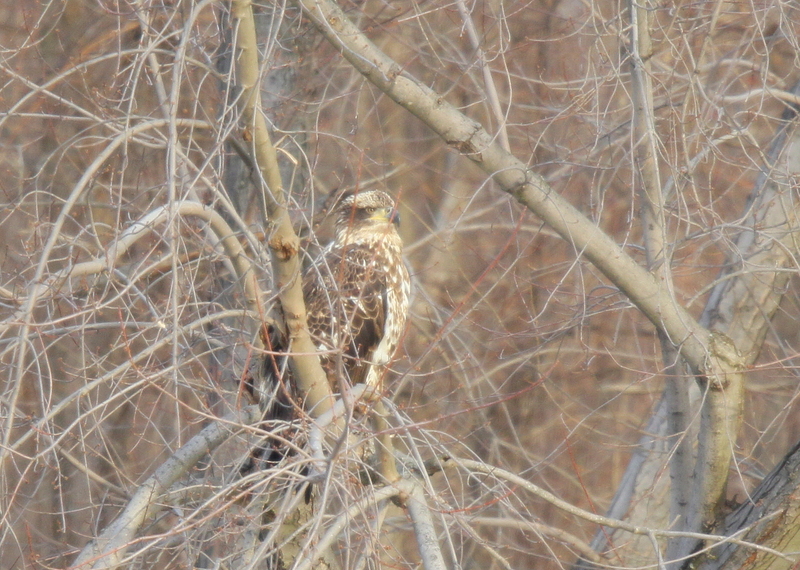 This first winter juvenile was seen perched on one of the trees behind the Lawrence Sanitation Water District pump house in North Andover. This is located at the end of North Main Street off of Sutton St. 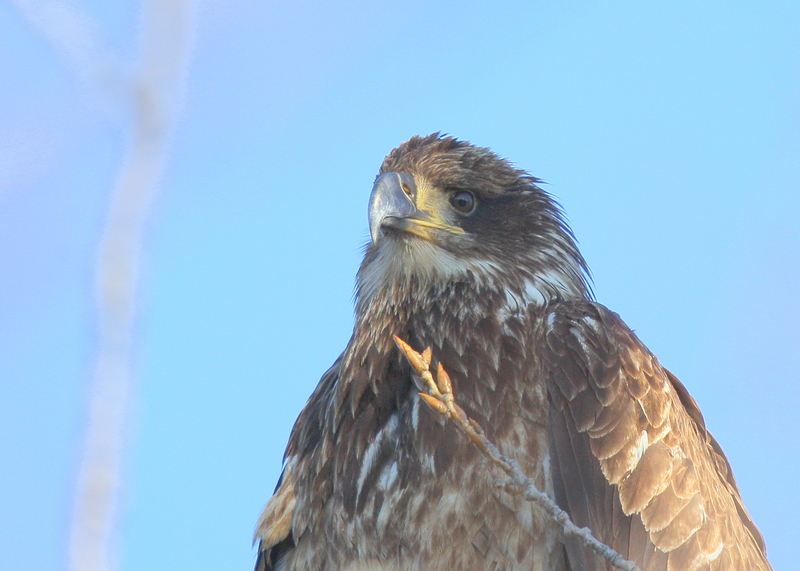 The eagle was just quietly perching on a beautiful sunny morning! Dark bill, tawny breast, brown bib, dark eyes. 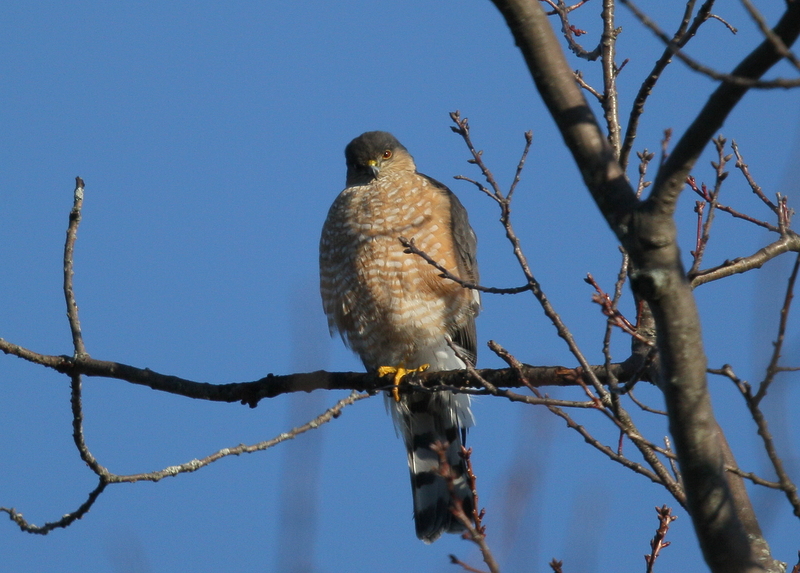 While checking for the Snowy Owl this morning with no luck, the consolation prize was this beautiful sharpie perched near the top of a nearby tree! The winter of 2013-2014 has been filled with endless surprises! 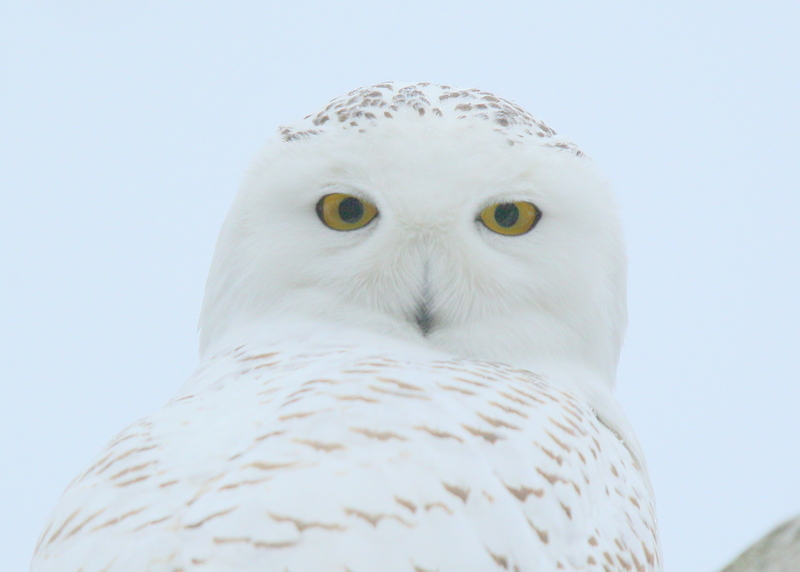 Snowy Owl sightings in unexpected places leads the hit parade of pleasant surprises. A good friend who serves as the Catholic priest chaplain at Holy Family Hospital in Methuen calls on my cell phone. He is bubbling over with excitement about the Snowy owl sitting on the roof atop the chapel, of all places! What a treat to be able to stop by and capture a few close up photos of this beauty! 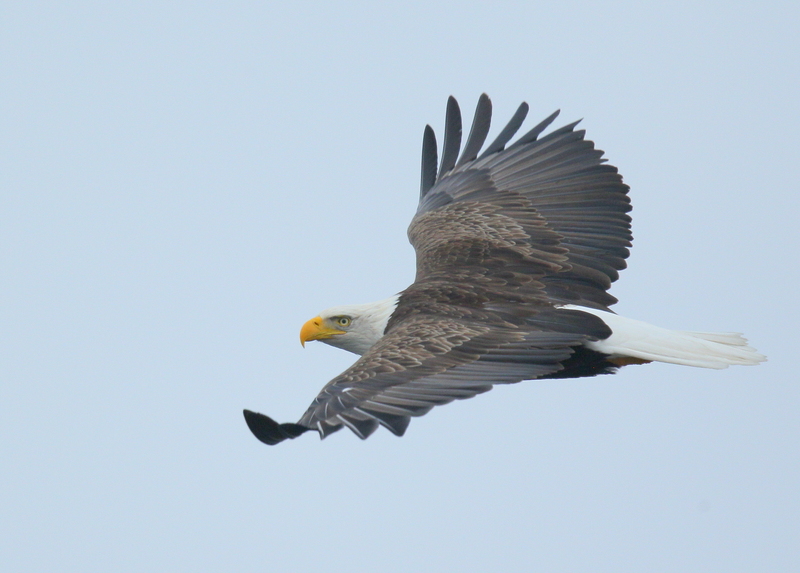 Bald Eagle adult in flight!! Later on Friday while heading over the Parker St. (Rt.114) bridge in a southerly direction, and while looking to the east over my left shoulder, a large bird in flight comes into view. Sure enough, an adult Bald Eagle heading west. turned around facing north, still on the bridge, the eagle loops twice above the bridge area and then glides to a landing on a tree near Pemberton Park on the north side of the river, west of the bridge. Make my way by car to rear of nearby building and remain in the car watching eagle for 15 minutes. Fascinating to be so close! On the far side of the tree, something caused the eagle to depart over the river westbound. It then looped and headed eastbound, and then westbound one more time before heading to a perch by the dam. A nice opportunity for some cloudy day photos!